"Poetry in Beauty: The Pre-Raphaelite Art of Marie Spartali Stillman," the first retrospective of one of a small number of professional female artists working in the second half of the 19th century Victorian art world, opens at Delaware Art Museum. 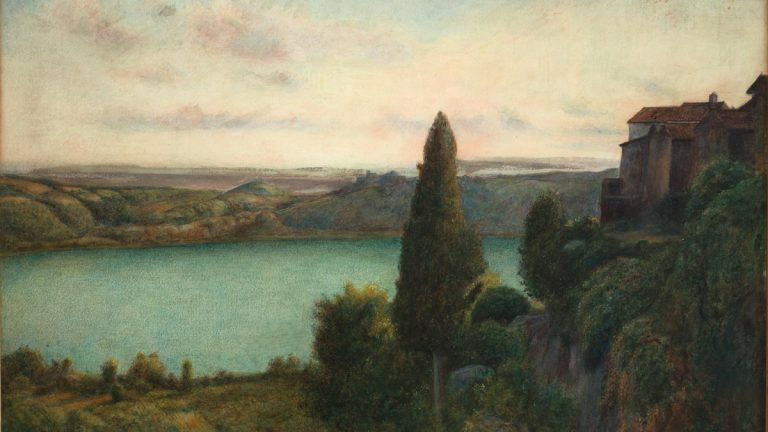 Pictured: The Lake of Nemi, 1899 Gouache and watercolor on paper, 16 x 22 ½ inches, private collection. Photo courtesy of Delaware Art Museum. Celebrating the written, spoken and visualized word. Plus, exciting new music premieres and honoring women artists. Robin Bloom shares her picks. The 14th annual First Person Arts Festival is back November 4-15 with the theme “Share Life,” dedicated to presenting art based on real life stories by a diverse group of well-known and emerging artists working across disciplines. 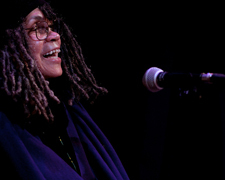 Events include performances, author events, visual arts, classes and workshops with musician Bilal, hip-hop artist Freeway, Sonia Sanchez (pictured), Ursula Rucker, Welcome to Night Vale podcast, kicking off with the Grand Slam, Thursday, November 5, crowning the “Best Storyteller in Philadelphia,” hosted by comedian and author Margot Leitman. Venues include Annenberg Center for the Performing Arts, Christ Church Neighborhood House, Head House Books, Plays & Players, and World Café Live. Photo by Darragh Dandurand. 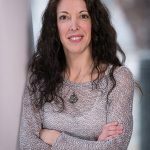 The 215 Festival continues the tradition of spotlighting Philadelphia’s neighborhoods and this year brings literary spirit to Northern Liberties. 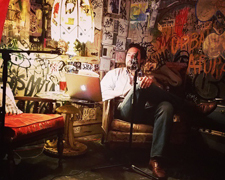 Philly’s annual literary arts festival offers diverse events that highlight the written, spoken and visualized word, like readings, performances, a walking tour, and the popular Bibliodiscotheque dance party, DJ’d by real-life librarians. Authors and artists include Sarah Blake, Andrew Ervin, Ken Kalfus, Annie Liontas, Asali Solomon, Lushlife, Tin Mouth and I Think Like Midnight at reading-friendly venues in NoLibs, November 5-8. 2014 photo courtesy of 215 Festival. 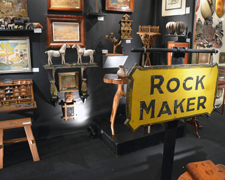 Winterthur’s 52nd annual Delaware Antiques Show returns to the Chase Center on the Riverfront in Wilmington, DE, this Friday, November 6 through Sunday, November 8. Award-winning interior designer and Winterthur’s own Thomas Jayne joins more than sixty dealers from around the country to offer a wide array of antiques, including furniture, rugs, ceramics, jewelry, paintings, and more. Related programs and events include an opening night party on Thursday, November 5, 5pm, book signing with Jayne on Friday, November 6 (after he delivers the keynote lecture at 10am), and an exhibit from the Museum of the American Revolution accompanies the show, 815 Justison Street. 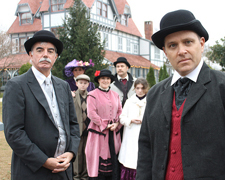 Sherlock Holmes Weekend returns to Cape May, November 6-8. Try and solve the mystery, “Sherlock Holmes and the Case of the Silver Fox” and win a variety of prizes. The weekend includes a “Search for Clues Tour” on Saturday that traverses the inns of Victorian Cape May in a hunt for clues. Also, on Friday and Saturday at 8pm, East Lynne Theater Company performs “Holmes and Carter Mysteries,” as a vintage-style radio show complete with sound effects and commercials, the First Presbyterian Church, Cape May, NJ. 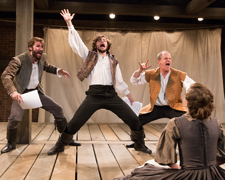 The suspenseful and clever Equivocation by Bill Cain is onstage at Arden Theatre Company, based on the historical event known as The Gunpowder Plot, when a group of Catholics in 1605 allegedly planned to assassinate King James I. “Shagspeare” is commissioned to write a historical play about the treasonous act from the government’s perspective. When the facts don’t add up, what is the playwright to do? This contemporary and bold new look at Shakespeare is directed by Terrence J. Nolen and stars Eric Hissom, Dan Hodge, Sean Lally, Tony Lawton, Campbell O’Hare and Ian Merrill-Peakes through December 13 on the Arcadia Stage, 40 N. 2nd Street, Philadelphia. Related programs and events include post-show discussions on November 5, 8, 11, 15 and 18, and open captioned and audio described performances on November 20-21. Photo by Mark Garvin. Azuka Theatre kicks off its new season as an Associate Member of the National New Play Network with the rolling world premiere of Lights Rise on Grace, November 4-22. 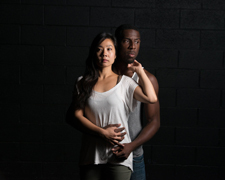 Named Outstanding New Play for its workshop at the New York Fringe, the production takes on issues of incarceration, sexuality and family, crossing race and culture lines and focusing on three people struggling under difficult circumstances. Starring Bi Jean Ngo, Ashton Carter, and Keith J. Conallen. Directed by producing Artistic Director Kevin Glaccum on the main stage at the Adrienne Theater, 2030 Sansom Street, Philadelphia. A Pay-What-You-Can Preview is Wednesday, November 4 and check out special Geek Week programming, November 11-16. Photo by Johanna Austin/AustinArt.org. Onstage at Delaware Theatre Company is Playing the Assassin by Wilmington native David Robson. 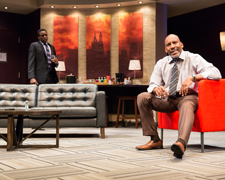 Inspired by a true football tragedy, the play takes an intimate look at hero worship, regret and forgiveness while examining America’s fascination with sports violence. Starring Ezra Knight and Garrett Lee Hendricks and directed by Joe Brancato, through November 8, 200 Water Street, Wilmington. 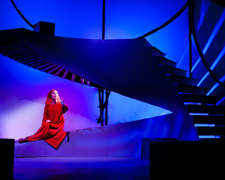 Curio Theatre Company takes on Margaret Atwood’s The Handmaid’s Tale. Adapted by Joseph Stollenwerk and directed by M. Craig Getting, the daring one-woman production is based on the writer’s 1985 novel and is set in the dystopian future, where, after the United States is overthrown by a theocracy, a woman must become a handmaid to increase population growth, through November 14, Calvary Center, 4740 Baltimore Avenue, Philadelphia. Photo by Rebecca M. Gudelunas. Exit Zero International Jazz Festival returns to Cape May November 6-8. 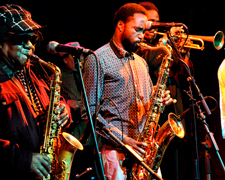 Performers include Jazz at Lincoln Center Orchestra with Wynton Marsalis, Bettye LaVette, PhillyBloco, Pat Martino Trio, Buster Williams, The Skatalites (pictured), Conjunto Philadelphia, Larry McKenna & Robert “Bootsie” Barnes, and Ali Jackson Trio at various venues in Cape May, New Jersey. Photo by Lee Abel. A powerful new composition dedicated to the memory of the twenty children and six adults killed during the shooting at Sandy Hook Elementary School in 2012 premieres this month in the Philadelphia area. 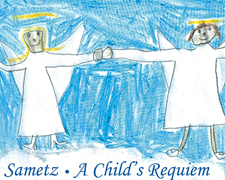 A Child’s Requiem was written by Steven Sametz, Artistic Director of the professional chamber choir The Princeton Singers and music professor and Director of Choral Arts at Lehigh University. The oratorio features a libretto formed mostly from the words of children and paired with lines from Ralph Waldo Emerson, Emily Dickinson, and H.D. (Hilda Doolittle), who was born in Bethlehem. Performances take place Friday, November 6 and Saturday, November 7 at Zoellner Arts Center, 420 E. Packer Avenue, Bethlehem, PA, featuring Tami Petty, soprano and David Vanderwahl, tenor along with the Princeton Singers, the Princeton Girchoir and 22 member orchestra and over 200 singers of the Lehigh University Choral Arts, under the baton of the composer. Opening the program is Vaughan Williams’ A Serenade to Music. The presentation heads to Princeton on Saturday, November 21, 8pm at Princeton Meadows Church, 545 Meadow Road, Princeton, NJ. Pictured: Drawing by Allentown native Jessica Stone. The area premiere of The Raven – A Poe Fest by Nicholas White comes to Philadelphia, Sunday, November 8, 3pm, at the Academy of Vocal Arts. While living in Philadelphia, Poe wrote many of his important works and Lyric Fest celebrates the “master of the macabre” with a program scored for five solo voices, string quartet and piano, rounded out with solo song settings of Poe’s poetic works, and readings from his prose. With singers Emily Noël, Roger Isaacs, James Reese, Steven Combs, and Suzanne DuPlantis, pianist Laura Ward, conductor Nicholas White, and narrator Duncan Wu, 1920 Spruce Street, Philadelphia. A co-production with Dumbarton Concerts in Washington, D.C.
Singing City’s fall concert American Feast combines the sacred classical choral tradition with the down-home sound of banjo, mandolin and fiddle, Sunday, November 8, 3pm, at the Church of the Holy Trinity. The DePue Brothers Band (pictured) joins the 90 member chorus for The World Beloved: A Bluegrass Mass by composer Carol Barnett, under the direction of Artistic and Music Director Jeffrey Brillhart. Program also includes the world premiere of Philadelphia Fanfare by John Conahan (who will conduct), and Jennifer Higdon’s Southern Grace, 1904 Walnut Street, Rittenhouse Square, Philadelphia. Stay for the post-concert talk and reception with artists. Photo by Brian Blauser. Delaware Art Museum focuses on the British Pre-Raphaelite painter Marie Spartali Stillman (1844-1927), one of a small number of professional female artists working in the second half of the 19th century Victorian art world. Poetry in Beauty: The Pre-Raphaelite Art of Marie Spartali Stillman, the first retrospective of the artist’s work, features approximately 50 pieces from public and private collections in the U.S., U.K., and Canada – many not exhibited in her lifetime, November 7 through January 31, 2301 Kentmere Parkway, Wilmington. The Delaware Art Museum’s collection features American art and illustration from the 19th to the 21st century as well as works from the English Pre-Raphaelite movement of the mid-19th century and is the only U.S. venue for this exhibition. 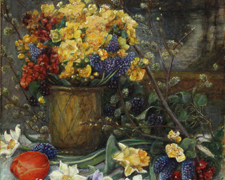 Pictured: Still Life (Spring Flowers and Landscape Painting), not dated, watercolor and gouache on paper, 19 5/8 x 13 ½ inches, private collection. 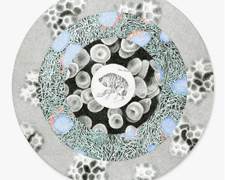 Mia Rosenthal: Paper Lens, new drawings by the Pennsylvania Academy of the Fine Arts alumna, re-launches the museum’s Morris Gallery program, showcasing the work of living artists in the Philadelphia area. 15 of the artist’s most recent pieces as well as a site-specific drawing on view are the result of her interest in particle physics and study of the universe’s smallest components, which prompted her to visit the Large Hadron Collider in Switzerland, through January 3 at PAFA, 118 North Broad Street, Philadelphia. Pictured: Microscope, 2015 ink by Mia Rosenthal. The artwork of Deirdre Murphy is on display in two solo exhibitions in Philadelphia. Winds of Change at Gross McCleaf Gallery features new paintings made while on residency at Hawk Mountain Sanctuary’s Acopian Conservancy Center, November 4-28. 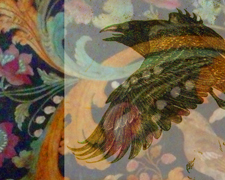 An opening reception takes place first Friday, November 6, 5pm-7pm, 127 S. 16th Street, Philadelphia. Migratory Paths, a solo exhibition of works on paper from 2010-2015 that explore the intersection of art and science, are on view through December 5 at URBN 534 Gallery, 5000 N. Broad Street, Philadelphia. Murphy is an adjunct professor at the University of Pennsylvania. 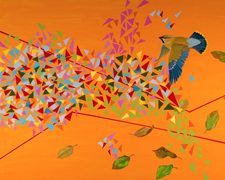 Pictured: Winds of Change by Deirdre Murphy. The Philadelphia Jewish Film Festival celebrates 35 seasons November 7-21, highlighting the diversity and commonality of the human experience with over 24 films from 9 countries at 7 different venues throughout greater Philadelphia. Look for almost all Philadelphia premieres, documentaries, dramas, a program of Jewish shorts, and more, covering a wide range of topics, including food, a look at WWII propaganda films, the Jewish sweatshop workers who made up the Jewish Anarchists Movement at the turn of the twentieth century in New York City, New Yorker author/illustrator Roz Chast, Israeli/Palestinian relations focused on women, human rights and health advocacy, Albie Sachs, and more. Enjoy post-film talkbacks with the directors and stars, panel discussions, book signings, performances, food, and more. Films include Dough, Theodore Bikel: In the Shoes of Sholom Aleichem, Gitel, Deli Man, The Outrageous Sophie Tucker, and East Jerusalem/West Jerusalem (pictured), a documentary chronicling the making of Israeli singer/songwriter David Broza’s album in East Jerusalem’s famed Sabreen Studio. 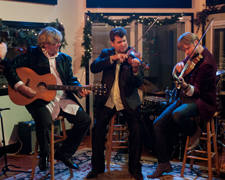 Broza will perform songs from the film following the screening on November 17. 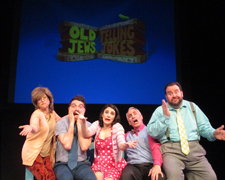 Old Jews Telling Jokes is onstage at the Bucks County Playhouse through November 22. Co-created by Peter Gethers and Daniel Okrent, the show features five actors in a revue that pays tribute to and reinvents classic jokes of the past and present with comical songs and more, 70 S. Main Street, New Hope, PA. Photo courtesy of Bucks County Playhouse. 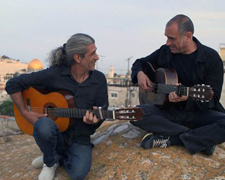 The 8th annual Israeli World Music and Jazz Phest is November 7-23 at various venues in Philadelphia as well as the University of Delaware, and Cape May (in conjunction with the Exit Zero International Jazz Festival). 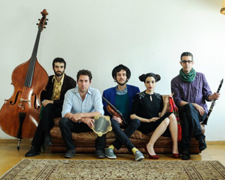 Featured performers include the Shai Maestro Trio, Oran Etkin, Alon Yavnai with the University of Delaware Faculty Jazz Ensemble, and the Philadelphia premieres of Fernando Knopf and the Latin Power Band and Baladino (pictured), performing Sunday, November 8, 7pm at the Painted Bride Art Center, 230 Vine Street, Philadelphia.